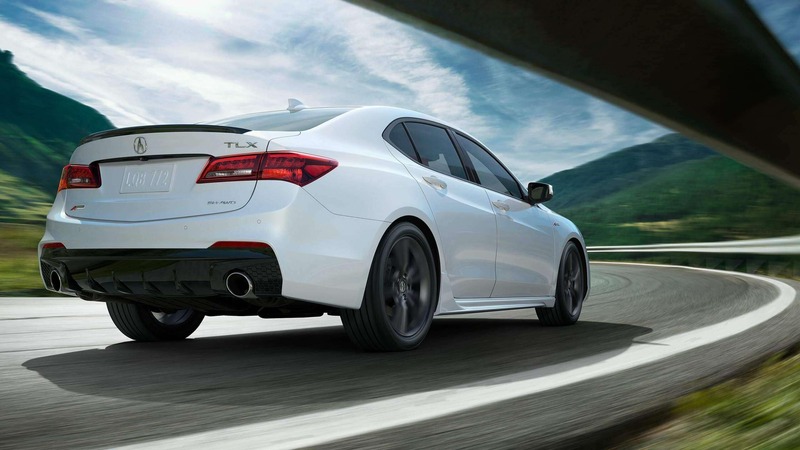 The 2018 Acura TLX SH-AWD Elite A-Spec comes with a 3.5L, 24-valve SOHC, i-VTEC V6 engine with direct ignition, capable of generating 290 horsepower at a peak rpm of 6200 and torque of 267 lb-ft at peak rpm of 4500. The 3471cc 2018 TLX SH AWD Elite A-Spec is the cream of the crop of variants. The all-wheel-drive features 9-speed automatic transmission with paddle shifters and is a delight on the road, especially owing to the grip of the tires. Modern cars rarely offer any feedback through the steering. Very few cars will let you feel anything what the front tires are doing. It is not very different with the TLX SH-AWD Elite A-Spec but you will feel the bite of the tires. The tires are wider and have a lower profile than what you may have been accustomed to in earlier Acura models. Being the premium trim, the Elite A-Spec surely stands out. The 2018 Acura TLX SH-AWD Elite A-Spec has blind spot warning and information system, cross traffic monitor, the in-house navigation system of Honda found in most Acura models with voice recognition, AcuraLink which is the connectivity system, the engine has an idle stop-start feature, there is an electronic gear selector, parking sensors in the front and rear, keyless access to front and rear doors other than the trunk and a surround view camera system. The 2018 TLX SH-AWD Elite A-Spec has 19″ alloy wheels, side mirrors with auto dimming, matte black internal headlights, darkened internal taillights, round LED fog lights, approach, and perimeter puddle lights, powered side mirrors, windshield wipers with rain sensors and black trunk spoiler. The TLX SH-AWD Elite A-Spec delivers 12 L/100Km on city roads, 8.2 L/100Km on highways and 10.3 L/100Km on combined roads. View our inventory. The 2018 Acura TLX SH-AWD Elite A-Spec features wireless charging for smartphones, ELS Studio with AM/FM and SiriusXM tuner, 10 speakers with one being the subwoofer and hard disk drive media storage. The front passenger seat in the 2018 TLX SH-AWD Elite A-Spec can be power adjusted to eight positions. TLX SH-AWD Elite A-Spec has ventilated front seats, heated rear seats, and steering wheel, red interior accent lighting, metallic footrest pedal, premium leather-trimmed interiors and power thigh extension. The Elite A-Spec is inarguably the best trim to roll out from Honda in the stable of Acura. It is a significant transformation from models rolled out in recent years. If you’re in the Toronto, Pickering or Ajax area, book your test drive at Acura Pickering today! View the 2018 TLX SH-AWD Elite A-Spec on Acura Canada.